According to the Copper’s Law, wireless communication systems capacities have doubled every 30 months since 1900 and with a clear accelerated rhythm these last three decades where the capacity has doubled every 18 months. Needs and new services cover as of now many new aspects of our lives, as a result needs and exigencies are huge. THz solid state components whatever the functionality… amplification, detection, generation, systems… Whatever the device… transistor, diode, photodiode are in the centre of the future challenges. Anode group through its competencies in III-V technologies responds, faces, to this challenge. Wireless telecommunication, is the fastest growing segment of the telecommunication industry. The new needs, now usual, such as laptops, mobile devices, tablets… and the number of those communicating objects imply a sum of data which will require huge bandwidth and ultra-high data rate. Thus, pressure is extreme on technological solutions. Several candidates, including ultra wideband, 60-GHz radio, free-space optical communications have been investigated, and terahertz (THz) waves have recently joined the race. Thanks to a higher usable bandwidth compared to millimeter wave communications, and less susceptibility to atmospheric variations compared to infrared based links, THz communications systems are well suited to satisfy the huge bandwidth demand. This is in this framework Anode group develops THz Transistors. It has to be noted that this activity corresponds to the historical activity of the group. In 2016, the group has restarted an activity on InP-HEMT (Fig. 1). The objective is to obtain maximum oscillation frequency FMAX beyond 1THz for THz wireless telecommunication, THz-spectroscopy and THz-imaging. In this frame, PhD student was recruited. Preliminary result reports a FMAX up 540 GHz and more recently (to confirm) 1,1 THz. Concerning the HBT (Fig. 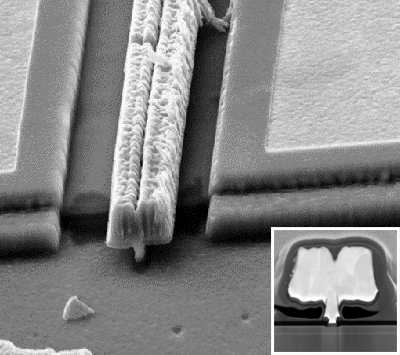 2), on an InP/InGaAs structure grown in InP substrate with a device area of 0.2×2.6 µm2, the reached performances are a FT of 350 GHz and FMAX of 650 GHz. 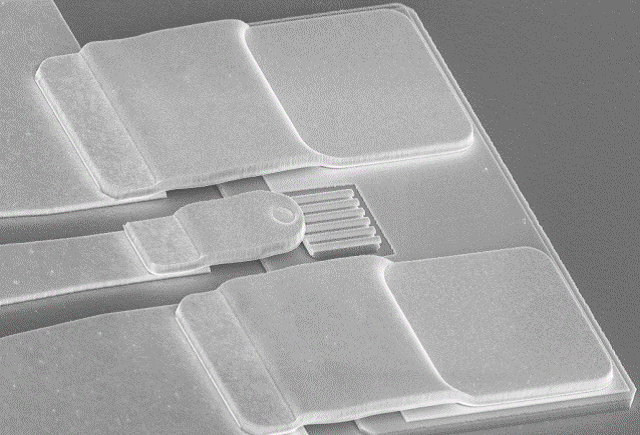 In power at 94 GHz, this device delivered an output power of 12 dBm and P.A.E of 30%. Fig. 2: InP/InGaAs HBT on InP Substrate. Frequency multipliers are solid-state devices widely used for signal generation in the millimeter wave range up to several THz. These sources rely mainly on the non-linear voltage-capacitance characteristic of a varactor diode. Today, GaAs-based technology is the main way for producing these diodes dedicated to the multiplication. 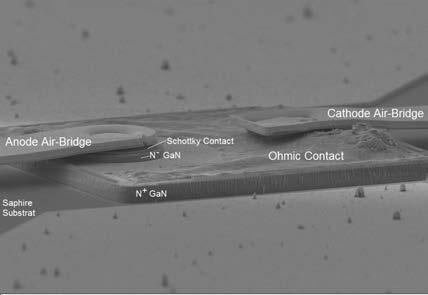 III-Nitride technology becoming more mature and the needs for high frequency and high power sources allow now envisaging the realization of GaN frequency multiplier. It is expected higher output power, 10 times the current state of the art obtained on GaAs technology, thanks to the large bandgap and high breakdown voltage of GaN. The group has already co-supervised a Ph.D student, Chong Jin, in collaboration with University of Darmstadt. The supervisor was Prof. Dimitri Pavlidis. Fig. 3: Schottky diode based on GaN. This work took place within the framework of an European contract. We have developed the fabrication process on this new material for the Anode group, the Gallium Nitride (GaN). All key steps have been studied; Chlorine ICP dry etching, ohmic contact and particularly the metal/semiconductor Schottky contact (Fig. 3). Diodes obtained were studied in a large signal characterization with the objective of fabricating a circuit. The design of a doubler circuit and a phase shifter has been realized. The phase shifter showed a 45° phase shift with 6-7 dB of insertion loss in the 32-38 GHz frequency range. Unfortunately the doubler was not fabricated by lack of time. Although this collaboration is now closed, GaN multiplier for THz applications is now a full subject of the group. In 2017, two projects have been obtained. The first one is an ANR project called SchoGaN (GaN Schottky Diode ForTHz Aplications – Coord. M. Zaknoune). The objective of SchoGaN is THz power generation up to 600 GHz with 15 mW, in other words 10 times the current state of the art. The second one is an international project leaded with the University of Salamanca in Spain. The project is called TediGaN for Technologies of Diodes on GaN, SSDs & Schottky. In the framework of an IEMN internal collaboration with Photonique THz group, Anode group co-supervises PhD students since 2004. The scope of this activity concerns the generation of terahertz signals. The part of the electromagnetic spectrum – 100 GHz at 10 THz – is sorely lacking in compact, efficient and powerful sources. 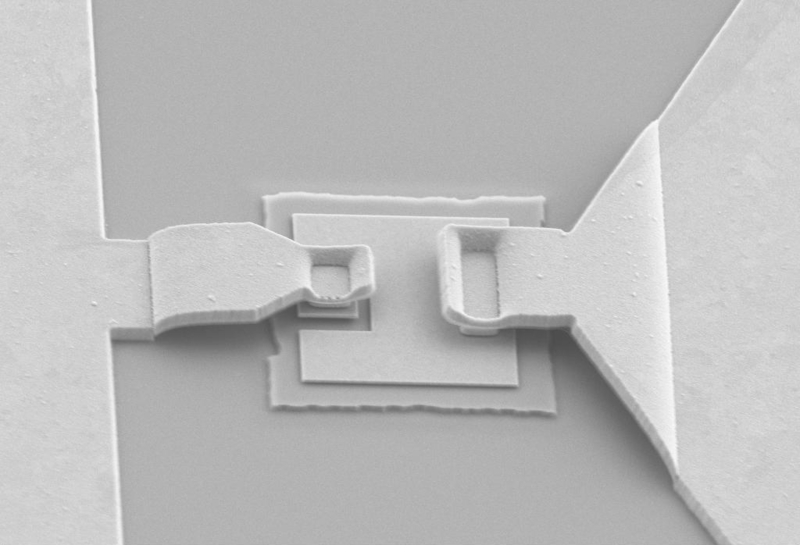 One possible way is the use of fast nano-photonics. UTC (Uni-Travelling Carrier) photodiode is a PIN-type diode where the optical absorption and the transport of the photo-carriers occur in two distinct zones, a p-type zone and an intrinsic-type zone. Photo-generated electrons in the p region diffuse to the intrinsic zone for collection. The technology of this device comes from that optimized for the HBT. Anode group has co-supervised a second and a third thesis and have been defended by F. Pavanello and P. Latzel. Many technological aspects have been optimized (ohmic contacts, top metal contact, etchings). In particular, an original solution based on the concept of extraordinary transmission (Fig. 4) has been developed and allows a lighting from the top, well easier to perform. An RF power of 2 mW at 50 GHz and 400 μW at 300 GHz was measured on UTC-PD of 6 and 3 μm side. In addition, the state of the art in optical efficiency with 0.2% was reached at 300 GHz. In order to increase generated power, a transferred UTC process on a high resistivity silicon substrate has been developed to ensure a better heat dissipation. A strong performance improvement at 300 GHz was reported with 700 μW and an optical efficiency of 0.76%. This shared activity continues today through several ANR contracts and industrial collaborations (Rohde & Schwarz and RP GmbH). Our UTC is used for THz wireless telecommunication applications. Thus, in indoor, we have demonstrated for the first time of single channel 100 Gbit/s THz transmission in QAM- 16 modulation format. A fourth thesis is ongoing. The subject is « 300 GHz signal generation for Wireless THz telecommunication ». It is supported by DGA. Fig. 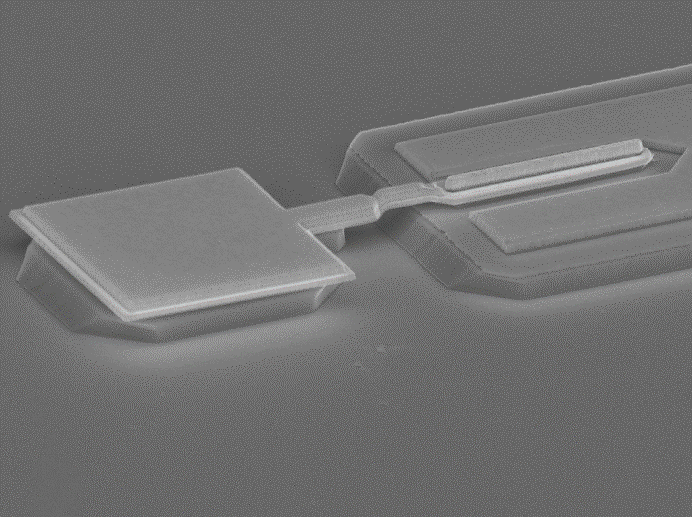 4: UTC photodiode fabricated on InP substrate. This activity is leaded into a framework of collaboration started in 2008, between the company MC2 Technologies which is a star-up from IEMN and two groups of IEMN, Photonique THz group and Anode group. Lasty, this activity was done in the frame of an ANR-SECURITY MILLIPRISM (Millimeter Passive Radiometric Imaging SysteM) contract. The objective of this work was the study and technological realization of a millimeter detector based on III-V materials mainly for use in imaging for security applications. Current quadratic detectors implemented in hybrid technologies remain very expensive and difficult to reproduce in mass market. To circumvent circuit cost and reproducibility limitations, the ambitious goal was to develop a passive sensor technology, without circuitry, for operation in the millimeter and submillimeter frequency bands, W band (75-110 GHz) and G (140-220 GHz). To do this, we needed a detection diode with very low noise floor and very high sensitivity β. The proposed device is based on the principle of the thermionic diode. Our first devices (Fig. 5) showed a high sensitivity up to 110 GHz. There is a sensitivity of 2 mV/μW, constant throughout the band and, important parameter it is therefore observed that the cut-off frequency has not yet been reached at 110 GHz.